One night when the Open Heart International (OHI) team was leaving the hotel for dinner in East Africa, a passer-by came up to Wendy Corkill and said “you are the one”. He went on to clarify she was the one who helped looked after his daughter in the Intensive Care Unit (ICU) after her heart operation many years ago and pulled out his phone to show photos of how well she was today. Wendy, who has lost count of how many surgical missions she has been on since 2005, explains this encounter has happened to her before. On a previous trip when the team was exploring in town, a mother recognised their faces and approached them asking if they were “the team from Australia?”. Amongst her OHI colleagues, the Cardiac Nurse Coordinator from Alice Springs has a reputation for effortlessly leading the ICU teams, including the latest missions in Rwanda and Tanzania. “I have been a nurse a very long time- 30 plus years and 20 of those would have been in Alice Springs ICU, which is small but also in a remote locality so therefore you have to be quite adaptable,” Wendy says. “I have a passion for nursing and I have always had a passion for nursing and maybe that’s why I go a bit above and beyond. Her experience in Alice Springs, which includes looking after neonates through to adults in ICU, to high dependency patients, as well as coronary care patients, has well equipped her for the OHI trips. “Where I have worked and going to remote areas has helped me understand that people here do not have resources,” she says. “I have always had an understanding of distance and travel because I have lived in the (Northern) Territory a long time so I understand what it is like for the patients to travel. Wendy thinks people need to be able to be adaptable and think on their feet in these kind of environments. 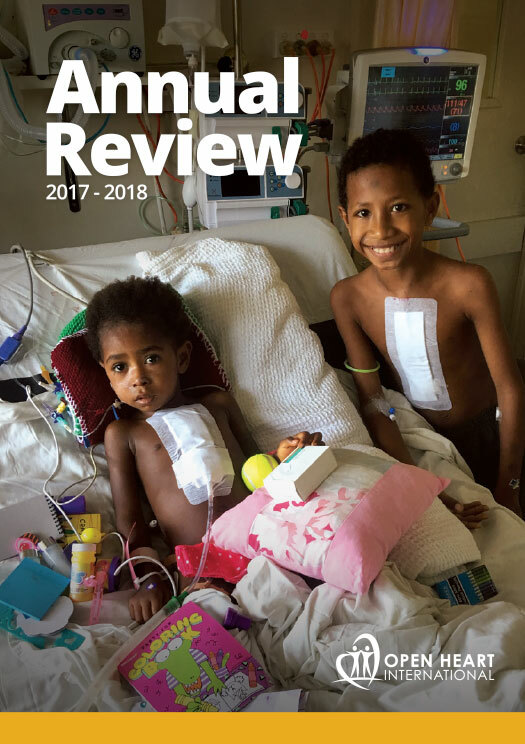 “On one trip in PNG, we needed bubble CPAP for a baby … Bubble CPAP is used for when babies have difficulty breathing because it creates oxygenating bubbles and helps generate a bit of PEEP,” she says. Wendy’s resilience for working in stressful environments stems from her time working in the Intensive Care Unit in the Territory, but also more recently as the Alice Springs Hospital’s Cardiac Coordinator. For the past five years she has been in charge of looking after adult patients who need either a cardiac investigation such as a coronary angiogram or cardiac surgery interstate. “I have developed different services at Tennant Creek, allowing people to have their tests done including exercise stress test and Holter monitors, so they don’t need to travel to Alice Springs,” she says. In addition to these services, Wendy also flies in and out to 15 Indigenous communities with a cardiologist and an echo-tech on day trips, providing a service to about 15-18 people each trip. “Cardiac patients need to have an ultrasound, we were finding was that people from the community would come for that and then not come back for their cardiac appointment. Despite a demanding job, Wendy manages to fit in about two OHI trips a year. “My work colleagues and my friends pick on me because I go away and work all the time, but I say it is quite enjoyable and to me it is different to my working life,” she says. “It is something I don’t do in my working life, I have looked after kids, but never post cardiac surgery children so it has been a new learning curve over the years. Over the years, some of the countries Wendy has travelled to with OHI include PNG, Cambodia, Rwanda, Tanzania and Myanmar. “When I come away, I quite like to teach but what I like more is to see how the local staff have developed,” she says. “Three years ago I met a very novice registered nurse, but today he was very competent and I can see a vast improvement in him.